So, that’s our 2016 Christmas season off to a flying (or is that freezing!) start. 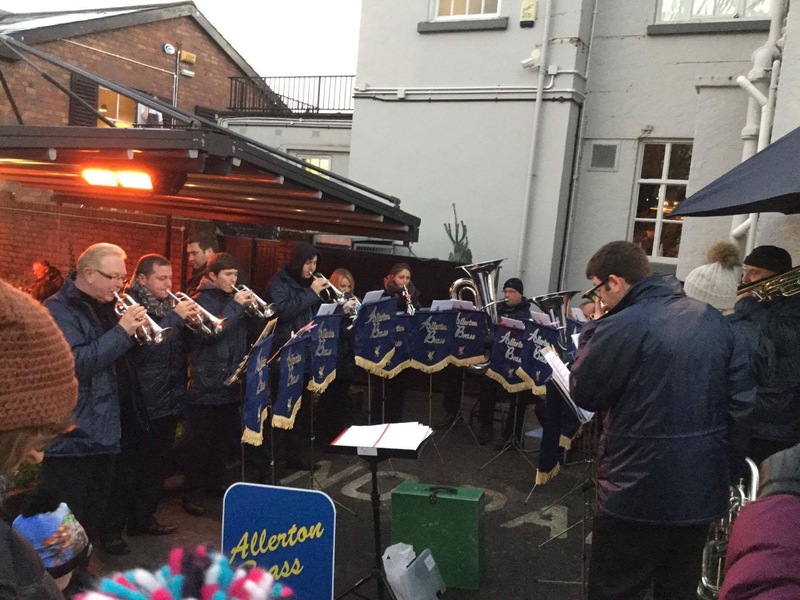 Saturday 26th November was the day the Christmas lights were switched on in Woolton Village and an ensemble from the Band were on hand to support The Elephant as they got into the Christmas Spirit with our musical tribute accompanied by fireworks and even a snow machine! 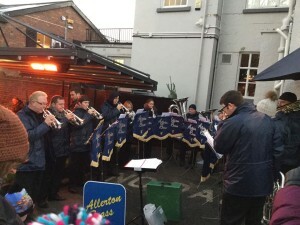 A great time was had by all as we entertained the crowds with a well chosen selection of Seasonal and other musical favourites. It is with regret that we have to announce our MD Pete Smith has left the Band. Pete took over as MD at the start of 2015 and has overseen the Band’s development over the last couple of years culminating in our recent success at the NWABBA Championships in Rochdale. Recently, however, following a promotion at work and with the growing volume of commitments the Band are taking on, Pete has found it increasingly difficult to maintain a satisfactory balance between his family, work and Band and has very reluctantly decided to step down. Pete has done a great job for the Band during his time with us both as a player and certainly since he assumed the role of MD and we all wish him well for the future. The Band are absolutely delighted that our good friend and Wingates Band’s MD Paul Andrews has very kindly agreed to step in and lead us in “The Wonder of Christmas” at the Capstone Theatre on Friday 9th December 2016 while we look for a permanent replacement for Pete.